Greetings everyone from beautiful Germany! Thank you, Moda Bake Shop for allowing me to come back again to present to you a new and rather simple miniature quilt using one charm pack, great colors, and a simplified cutting technique to make these impromptu miniature goodies – miniature quilt, pillow, and pin cushion. The block size here is four square inches, but don’t let it intimidate you. It is easier than it looks. You can check out other free patterns on my blog – www.easypatchwork.blogspot.de. Don’t forgot to “join” my site to win a free charm pack to make this pattern! Please use a SCANT ¼” seam allowance unless otherwise specified. This is very, very important when sewing smaller blocks together. Sew one A strip to the top and bottom of the center square. Finger press outwards. Sew one B strip to both sides of center rectangle. Iron outwards. Square to 3″. NOTE: Strips C and D are longer than you need, but this will allow you to match up patterns in the fabric when sewing if you wish. Sew one C strip to top and bottom of white square. Finger press outwards. Sew one D strip to both sides of white rectangle. Iron. 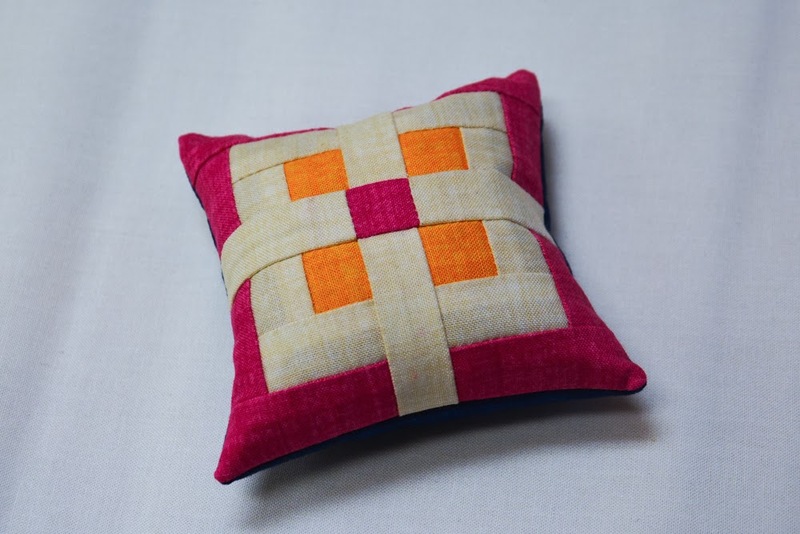 Square to 4½”. Repeat to make a total of nine blocks. 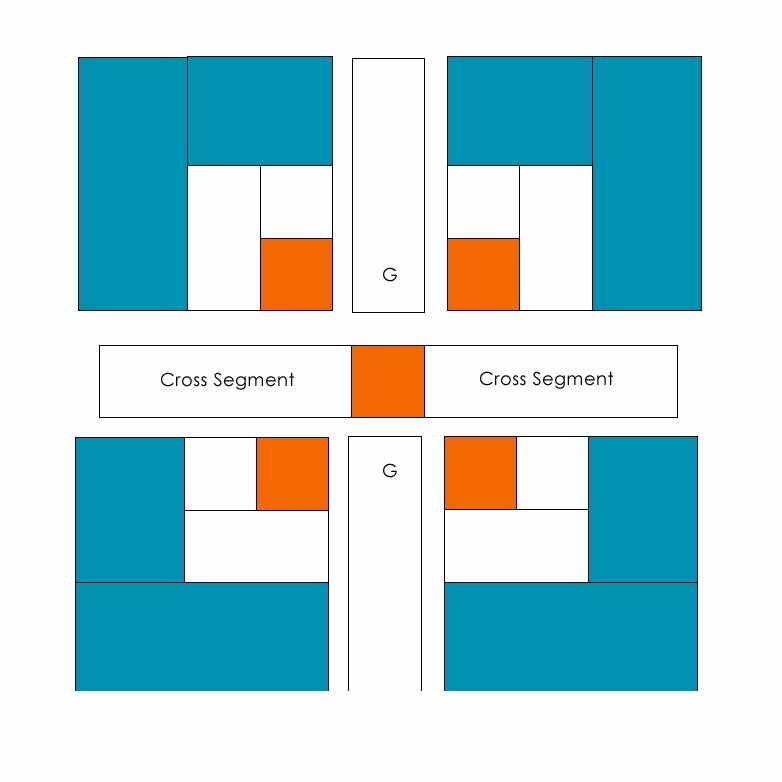 Find the center of each square (2¼”) and cut into four center square segments. Keep together and set aside. 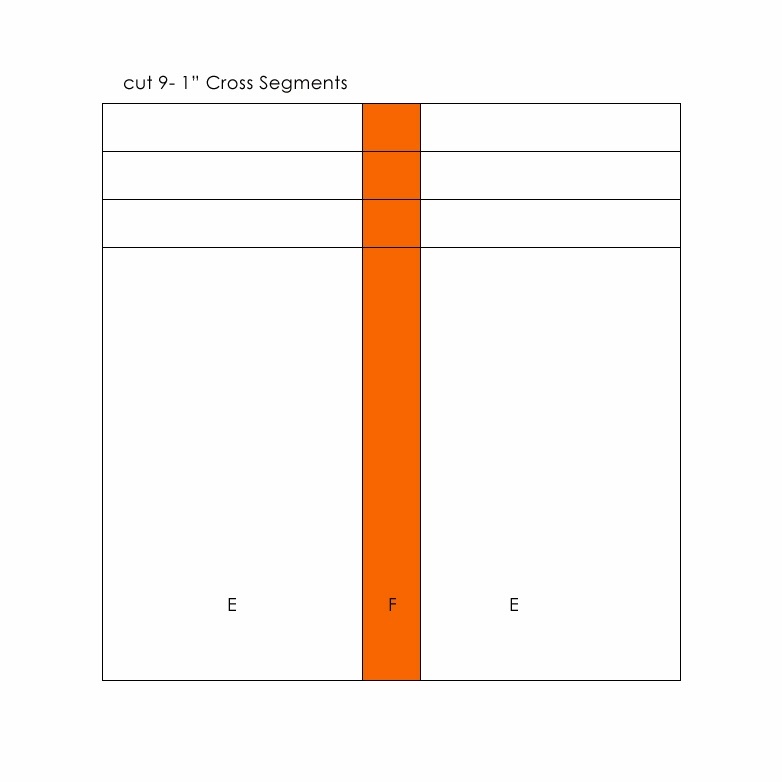 Sew one E strip to each side of orange F strip. Press toward white strip. Cut into 1″ cross segments. Sew one white strip (G) between two matching center segments. Press seams inward. Repeat for the other side. Sew one cross segment to each side of center block you just made. The seams will cradle. Repeat to get a total of nine miniature blocks. Press with iron and square to 4½”. Arrange the nine blocks as you wish. Sew together in rows of three. Sew the three rows together. Iron and square. 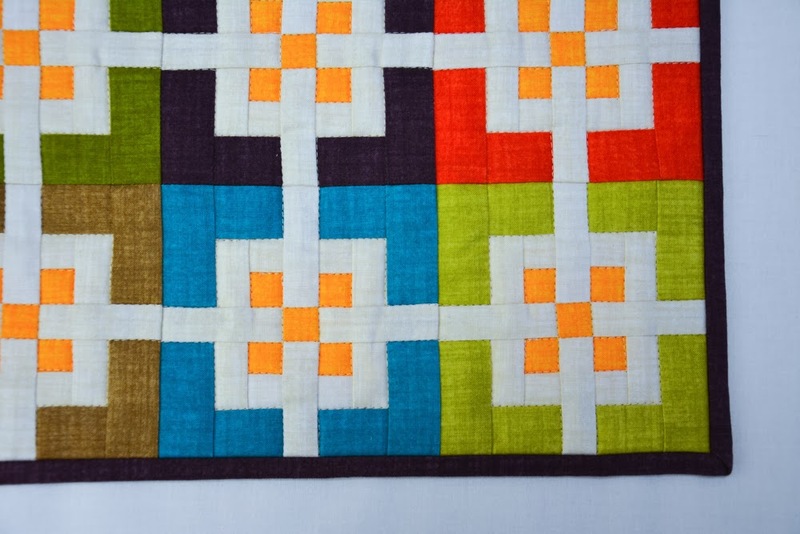 Layer your front and batting (and backing if making a mini-quilt). Quilt as desired. Cut two strips 2 x 12½” and sew to top and bottom of the front. Cut two strips 2 x 15½” and sew to the sides. Iron outward. Square if needed. 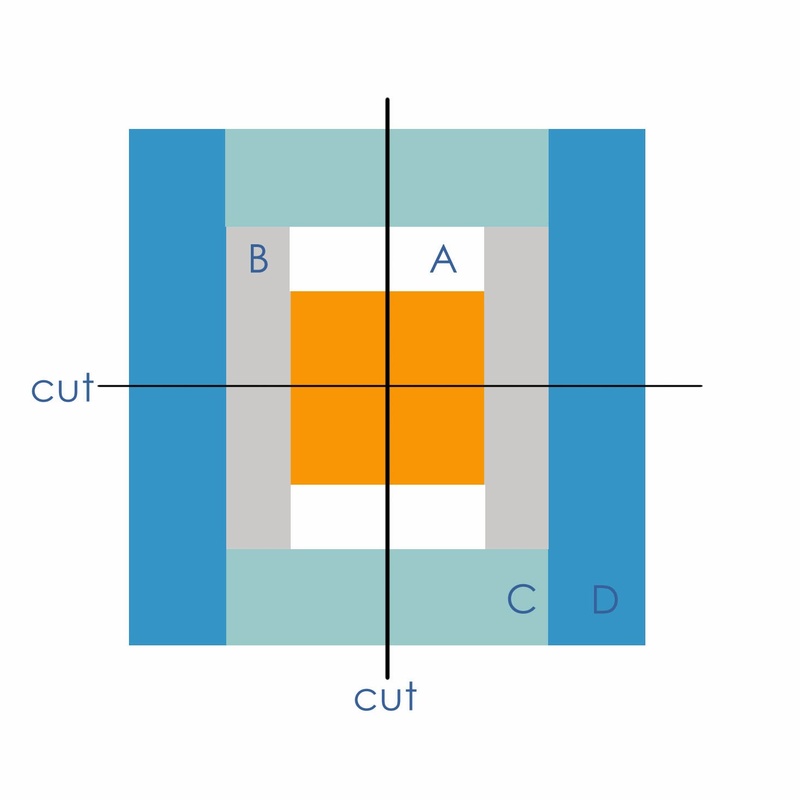 Cut one square 15½ x 15½” (H) and one rectangle to 8 x 15½” (I). Turn one edge under ¼” (toward the wrong side of the fabric) twice to get a double fold on both (H) & (I) pieces. Sew to get a smooth and encased raw edge. 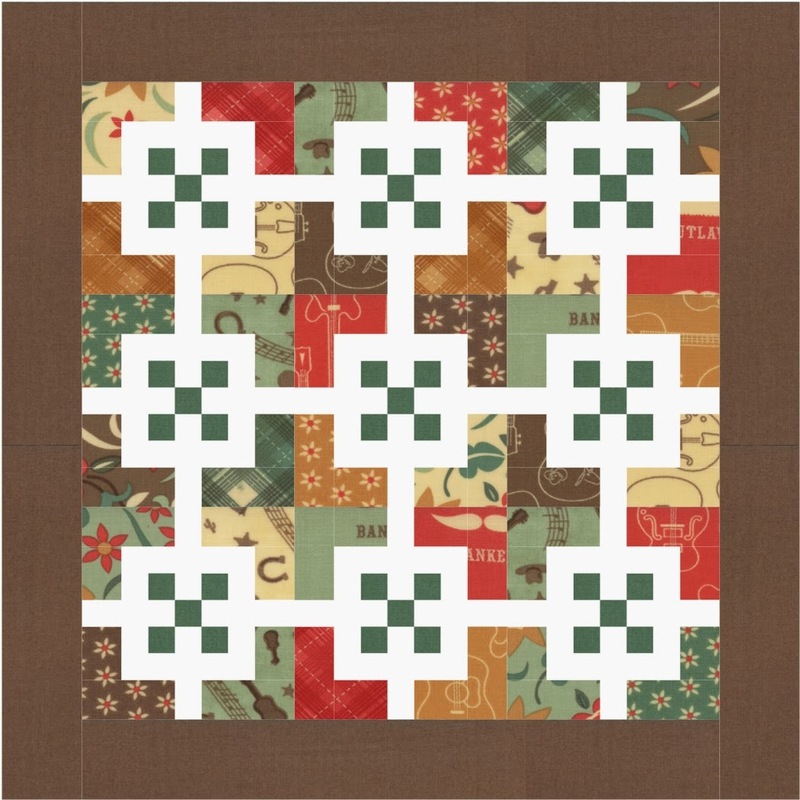 Layer your Patchwork Front (facing up), Backing I (facing down) and Backing H (facing down). Sew with a 3/8″ seam allowance around the edge leaving a 2-3 inch gap to flip right-side-out. Clip the corners and flip. Press. Fill with a 15″ pillow form. Make continuous-folded 2″ binding strips from dark blue fabric. Apply using your favorite method; I applied to the front using a ¼ seam allowance, folded back and hand-stitched in place. Sew pieces A – D using the above instructions for center construction. 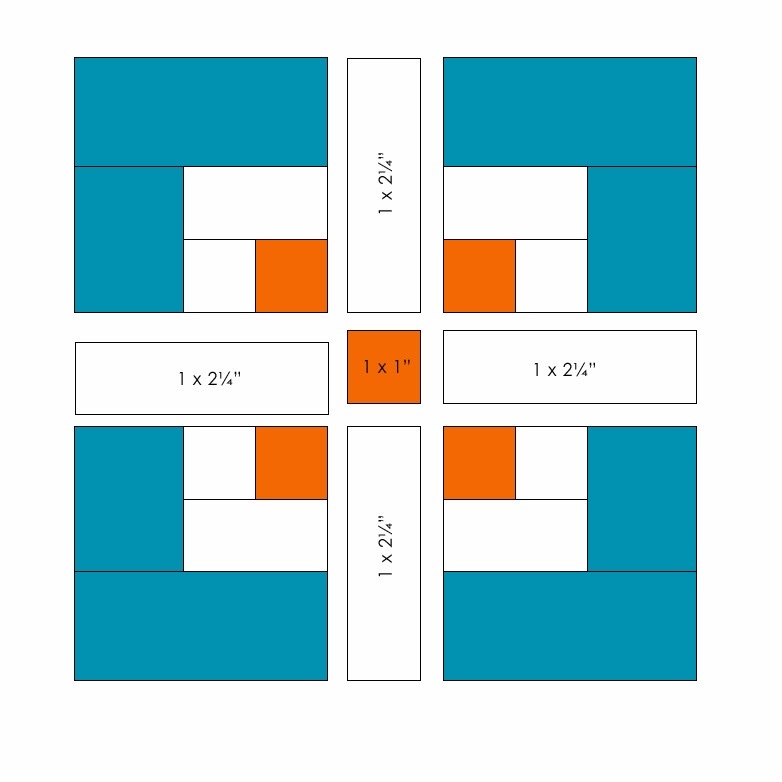 Sew one G rectangle to top and bottom of two sliced squares from the center construction. Press inwards toward white strip. Repeat for the other side. Sew one J square between two G rectangles. Press outwards. 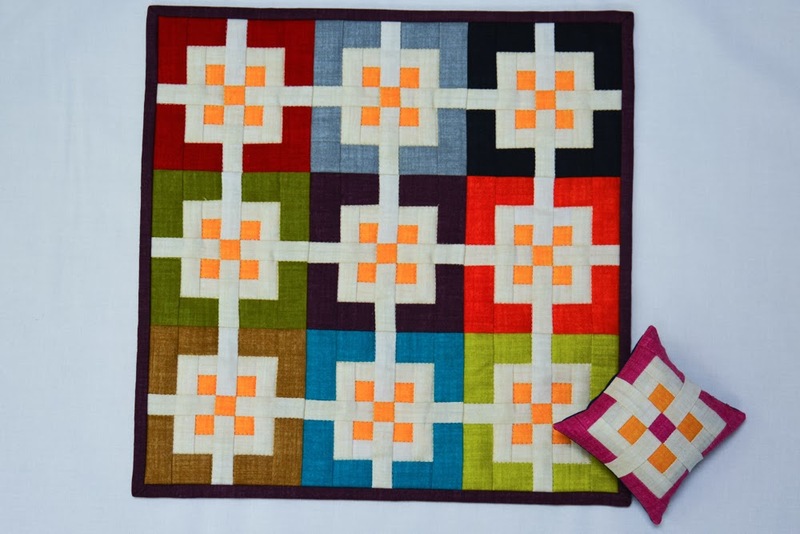 Sew cross segment between two square segments to complete the block. Press and square to 4½”. Cut backing fabric to 4½” square. Place backing fabric face up and Forgotten Five Patch face down. Sew using a 3/8″ seam allowance leaving a 2″ opening to flip. Trim corners, flip and press. Fill with unused, dry rice. Close using a hidden blanket stitch. If you like the look of scrappy, mix and match the center units like here featured with Honky Tonk! I hope you have enjoyed this tutorial. I would love to see what you have made if you decide to use this tutorial.